Note: I would like to share with you through these few words, photographs and hyperlinked websites, a 3 Dimensional experience as though you were actually there with us. Click on any photograph and it should enlarge to different size ….. at least half screen or size full screen. It will be clearer in detail than the photo on the post. It will be as if you were really there looking at the actual scene. You are an arm chair traveller with us. Ponds in the garden were easily made in the initial earthworks for the house when the site was excavated in 1981 (34 years ago from 2015). Our land is on a sandstone base four metres down below the soil surface. We have on our land about a metre of black sandy topsoil which becomes a heavy clay layer which then goes down to the sandstone base. With heavy rain, the water sinks down to the heavy clay layer and sits on top of the clay. It is like a vast underground dam and with slight southern slope of the land, this underground water slowly drains down the slope over several months. Three months later, this water is readily available at the surface if you dig a hole. Woe to you if you went down in a vehicle. The soil would turn to instant bog and you would need to be towed out by another vehicle on a firm surface (that is why we had many horizontal logs and branches laid down in our extensive driveway coming down to our house). When the heavy clay layer is broken into, this underground water trickles out and down to fill any depression in the clay base below. It then becomes free water with an extensive surface. 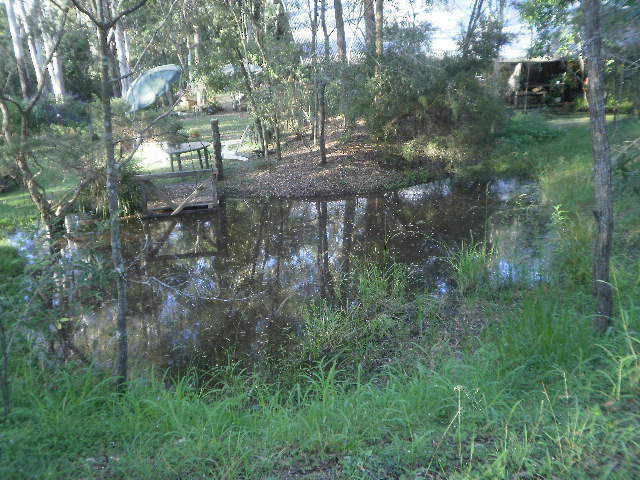 By excavating shallow ponds in the clay (some up to 0.75 metres deep), I have created four ponds that drain this water away from the house. One pond is a deep one outside the glass wall of our bedroom. It drains in different southern direction away from the house. See the three photos below. This pond had been planted several years ago with waterlilies which have large plate-like floating green leaves and produce blue flowers. These flowers eventually produce seed which sinks down to rest on the sandy base of the pond. 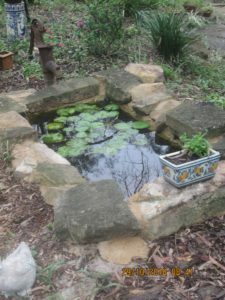 The pond may dry up to bare sand and leaf mulch that year as the underground water ceases and the ponds slowly evaporate over six months. In the next year, the heavy rain will repeat the process and the ponds will fill again. The waterlily seed resting on the sandy base of the pond, quickly produces new waterlilies with their floating green leaves and blue flowers. Occasionally, wild black ducks come to paddle in this pond and provide a sense of movement in the serene landscape. 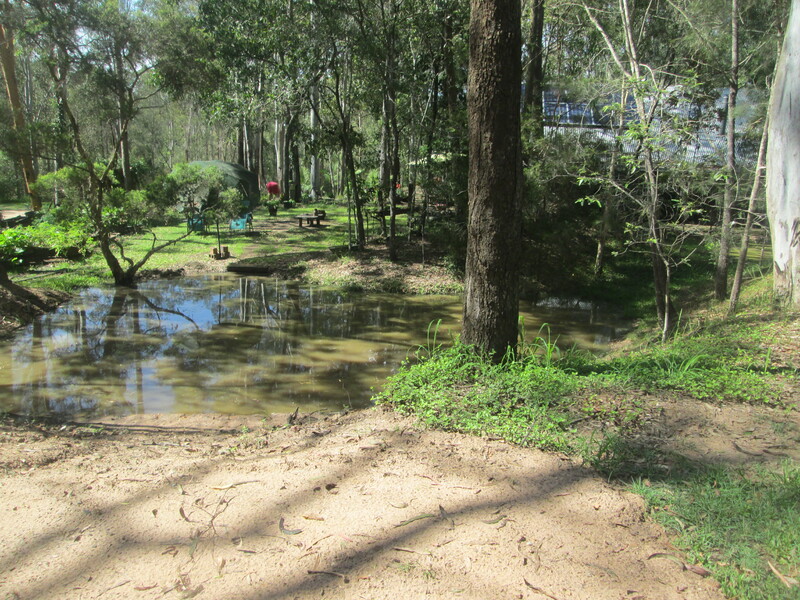 The two large ponds on the north side of the house, drain into each other and then into another lower deep pond and eventually down the hill to open land. With the new bore which was only drilled in September 2015, we have abundant water for our garden in dry times and water to keep the ponds full. 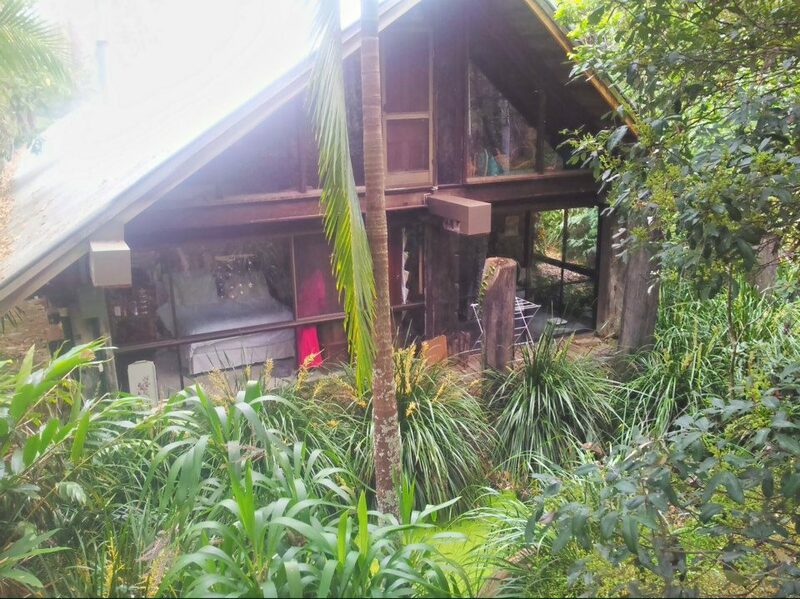 It is wonderful in having the contrast of the still reflective water surface and the ever changing three dimensional nature of the garden and surrounding bush. The heavens declare the glory of God, and the sky displays what his hands have made. One day tells a story to the next. One night shares knowledge with the next without talking, without words, without their voices being heard. Yet, their sound has gone out into the entire world, their message to the ends of the earth. (Harriet and I have a Christian Spirituality). Read more about how Spirituality is quite different to Religion at this post. Life didn’t come about by evolution and by chance. My friend Tas Walker is a very competent geologist who has a Bachelor of Science majoring in Earth Science with first class honours, a Bachelor of Engineering with first class honours in Mechanical Engineering and a Doctorate in Mechanical Engineering. He has a website ‘Tas Walker’s Biblical Geology’ where he talks at length about the Geology of the Earth. This view of life is in clear contradiction to current evolutionary views on life. …. Looking down on the Master bedroom area of the garden with its pond …..
…. 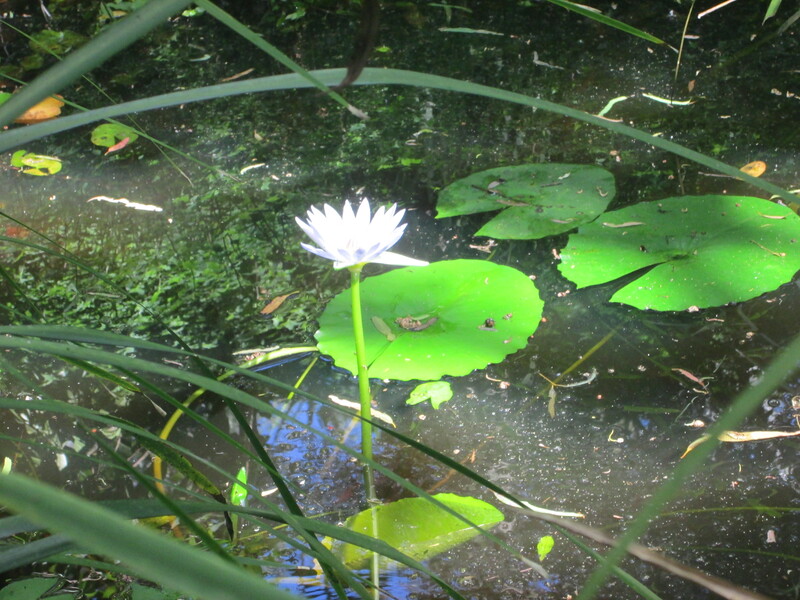 The pond with a water lily and blue flower …. 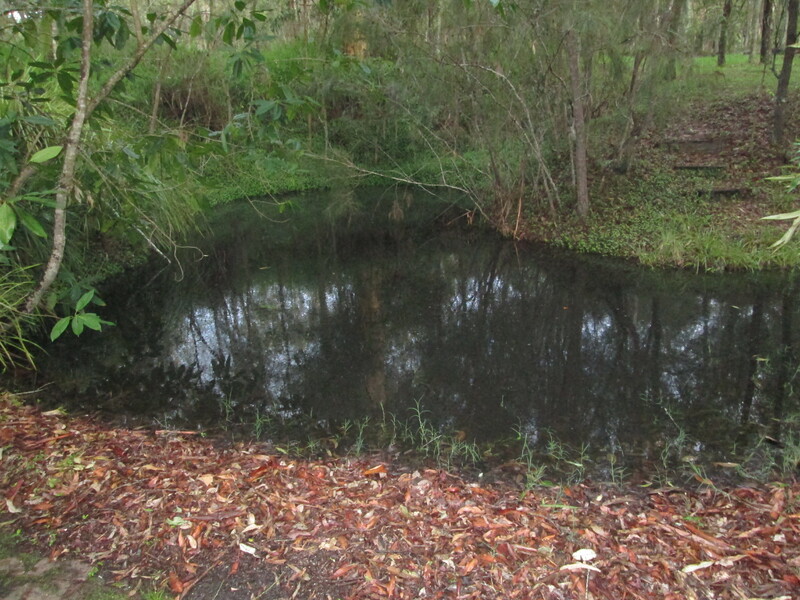 … Pond 1 on the northside of the house drains into Pond 2 as shown below. down the hill to open land …. 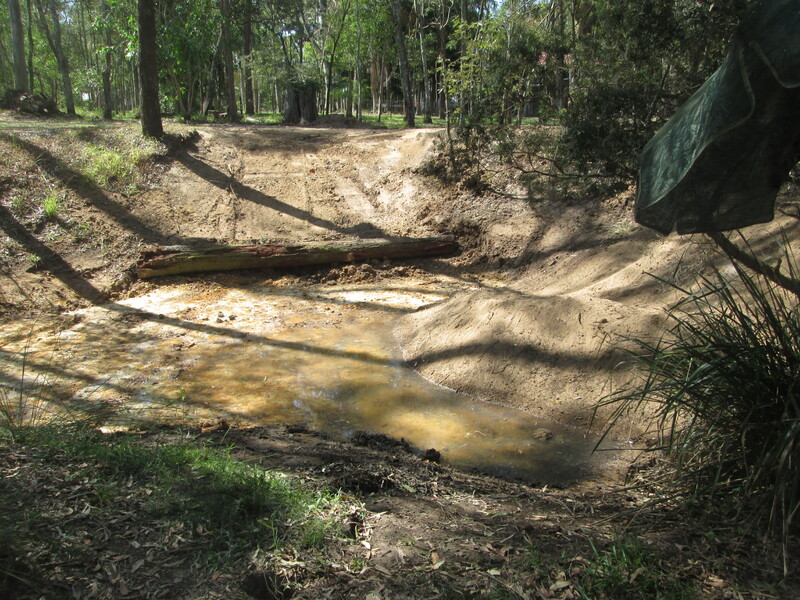 Dipping Pool in April 2016.
driveway bridge and down into the paddock below. 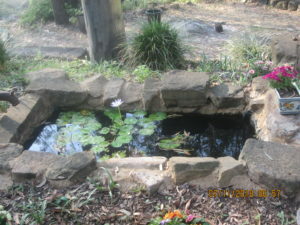 See the Dipping Pool post for photographs. …. 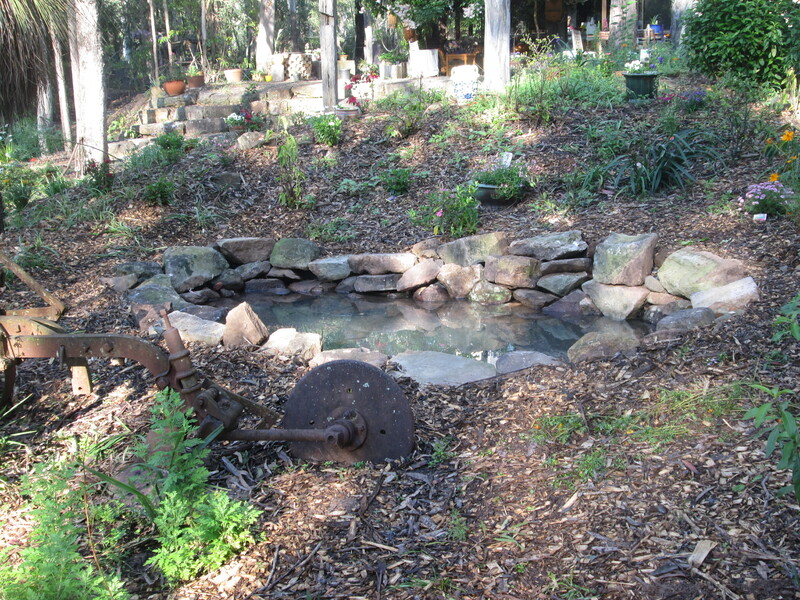 The natural dipping pool was filled with bore water which was very clean at the time. water which will make it clean again ….. There is a very nice section of the garden in a rectangular rock pool which is seen as you come up the steps to the front door. The rock pool has very clear water in it with a floating waterlily in a big pot. 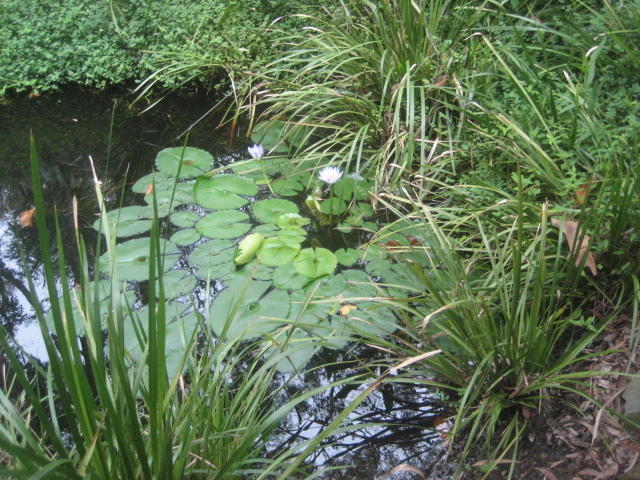 The waterlily leaves cover half the pond while the rest of pond is a clear surface that reflects the overhead trees. 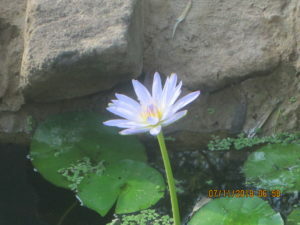 In early November 2018, the waterlily had several blue waterlily buds emerging from the water level. These emerged as eye -catching blue waterlily flowers. Ochre coloured sandstone set in ochre coloured concrete forms the rock pool edge. The pool is simply formed by digging out a rectangular hole in the ground and lining the hole with a black vinyl pool liner. The pump has been discontinued due to the frequent and detailed maintenance of the system and time needed to build and maintain other sections of our garden and land.